Ergonomics can be simply defined as the study of work, but more precisely, as the science of designing the job to fit the worker, rather than physically forcing the worker’s body to fit the job. When the companies adapt tasks, workstations, and equipment to the worker, they can reduce physical stress and eliminate potentially serious, or even disabling work- related musculoskeletal disorders (MSD’s). Upper limb: rotator cuff tendonitis, radial tunnel syndrome, epicondylitis, others. Back injuries: herniated disk, lower back pain. Construction Safety Regulation, article 18 (manual handling). According to the Occupational Health Council, in 2014, 15% of all reported accidents were associated to physical overload risks; and in 2015, the rate increased to 18%. Futuris uses internationally recognized tools that assess risk the factors on each job position and the different work conditions. RULA was developed to evaluate the exposure of individual workers to ergonomic risk factors associated with upper extremities MSD’s. The RULA ergonomic assessment tool considers biomechanical and postural load requirements that the job tasks/demands on the neck, trunk and upper extremities. The MAC tool was developed to help the user to identify high-risk workplace manual handling activities, and can be also used to assess the risks associated with load lifting tasks, carrying and team manual handling activities. The Assessment of Repetitive Tasks is a tool designed to assess repetitive tasks involving the upper limbs. It assesses some of the common risk factors in repetitive work that contribute to the development of upper limb disorders. It is a guide created by Health and Safety Executive of United Kingdom that shows how to ensure the safety and suitability of workplace seating. It is addressed to those responsible of health and safety departments and it is also useful as guide for employees, manufacturers, designers, suppliers and users of industrial and office furniture. It is a checklist created by Occupational Safety & Health Administration (OSHA). It can help to create a safe and comfortable workstation. This tool assesses working postures, seating, monitor, working areas and accessories. Futuris team has carried out more than 500 ergonomic assessments using the tools described above. The table bellow shows a summary of the assessments carried out by Futuris. ICE Power & Utilities Ergonomic risk assessment for the operations of three hydroelectric plants and designing of control measures. Allergan Medical Products Pharmaceutical & Health Care Ergonomic risk assessment (Job Safety Analysis) at approximately 30 workstations associated with manual operations for the manufacture of medical devices using MAC and ART tools. Designing of an action plan and support in the selection of engineering measures along with the site staff through an Ergonomic Committee. Ergonomic risk assessment in 10 workstations of the Coca Cola Concentrate Plant through the application of 15 MAC evaluations (evaluation of manual handling), 46 ART evaluations (evaluation of repetitive movements) and 44 biomechanical evaluations. Priorities were identified, additional infrastructure controls were proposed, and staff trained. Migración Services Ergonomic evaluation for eight immigration offices across the country and a total of 228 workers, 225 evaluations of computer stations, 15 MAC evaluations (evaluation of manual handling), 27 evaluations ART (evaluation of repetitive movements) and 228 anthropometric evaluations were applied. The main risk factors included the poor design of some workstations, incorrect use of equipment, inadequate postures and manual handling of loads in places with obstacles such as doors and uneven floors. Improvements were proposed in infrastructure, training requirements and the creation of an order and cleaning program. GlaxoSmithKline Services Ergonomic risk assessments for the offices in shared spaces. Fiserv Services Ergonomic risk assessments for the offices in one of their facilities. Hologic Surgical Products Pharmaceutical & Health Care Risk Assessment in Health, Safety and Ergonomics, for 252 production job positions. A tool was developed that combined the results of ergonomic evaluations (through ART and MAC) and the analysis of other health and safety hazards. In addition, a rotation plan was developed for each production line in which positions with low residual ergonomic risk rotated with others of high ergonomic risk, in order to decrease the risk level. Banco Popular Services Risk Assessment in Health, Safety and Ergonomics, for over 50 administrative job positions. 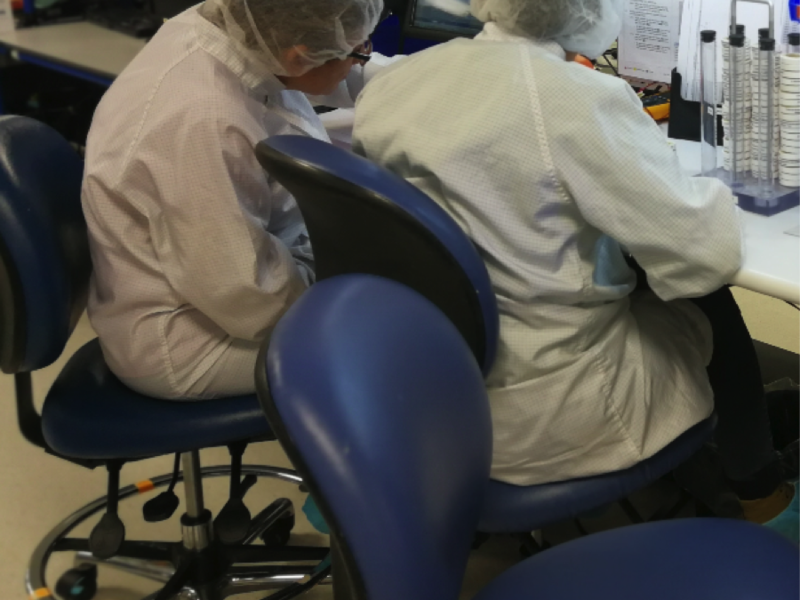 Philips Volcano Pharmaceutical & Health Care Ergonomic risk assessment for 80 production job positions (through RULA, ART and MAC) on a medical device manufacturing plant. In addition, a rotation plan was developed for each production line in which positions with low residual ergonomic risk rotated with others of high ergonomic risk, in order to decrease the risk level.